Through blissful years in changeless Avalon." Avalon, the isle of wonders, is slipping gradually into the mists, taking away with it forever the magic of the Ancients. Will the People of the Wind and the old gods intervene, or will they leave their children to the mercy of the wave of invaders sweeping the Isle of the Brave? Is the future High King really their chosen one? The People of the Wind, the Tylwyth Teg, their powers and their king. 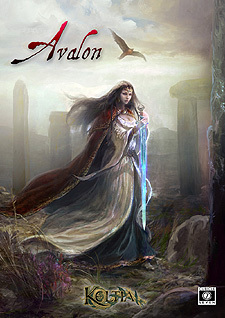 Avalon and Ker Is, two sacred centres of the Old Religion. Three scenarios that can be played as one-shots or included in a campaign. "The Sacred Sword", the continuation of the Arthurian campaign that began in the Keltia Core Rulebook.